Open your eyes to the world of nature with this fantastic introduction to Britain’s wild flowers. 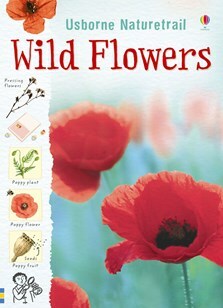 Includes step-by-step instructions for activities like flower pressing, growing seeds and identifying wild flowers. With internet links to recommended websites with games, activities and online identification guides. A fantastic guide to identifying wild flowers, with clearly drawn examples of the plants, their flowers, leaves and seeds and also the various uses we make of wild flowers from perfume to cooking to medicines.